The advantages of Clean URLs and URL rewriting from an SEO perspective are topics we are incorporating as a standard part in the process of planning, designing and programming customer websites. Pallasart has created our own custom PHP rewrite engine for the web and are implementing in all of the sites we create with great success. The most significant advantages are; one, static URL’s rank better in Search Engines; two, Search Engines crawl the content of the static URLs much faster as compared to the dynamic URL and three, static URLs look much prettier and friendlier to the end-user. 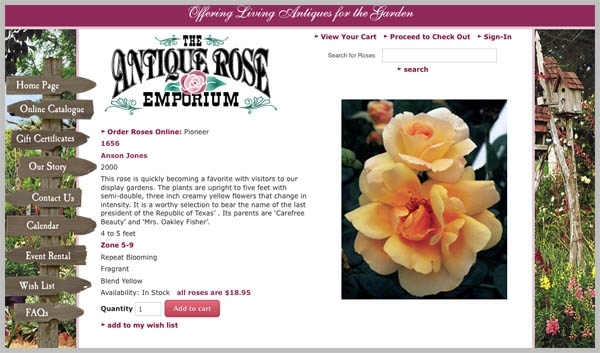 You can see the advantages in the rewritten URL name which has greatly improved searches on all the popular and competitive rose varieties offered in their site. A rewrite engine is software that modifies a web URL's appearance (URL rewriting). Rewritten URLs (sometimes known as short, fancy URLs, or search engine friendly - SEF) are used to provide shorter and more relevant-looking links to web pages. The technique adds a degree of separation between the files used to generate a web page and the URL that is presented to the world. The links are "cleaner" and more descriptive, improving their "friendliness" to both users and search engines. They prevent undesired "inline linking", which can waste bandwidth. They hide the inner workings of a web site's address to visitors, which can prevent them from discovering query strings that could compromise the site. The site can continue to use the same URLs even if the underlying technology used to serve them is changed (for example, switching to a new blogging engine). From a technical standpoint, Clean URLs, RESTful URLs or user-friendly URLs are purely structural URLs that do not contain a query string and instead contain only the path of the resource (after the scheme [e.g. http] and the authority [e.g. example.org]). This is often done for aesthetic, usability, or search engine optimization (SEO) purposes. Other reasons for designing a clean URL structure for a website or web service include ensuring that individual resources remain under the same URL for years, which makes the World Wide Web a more stable and useful system, and to make them memorable, logical, easy to type, human-centric, and long-lived. Call us at 512 469-7454 to learn more about Clean URLs abd URL rewriting and the impact this can have on the success of your website.